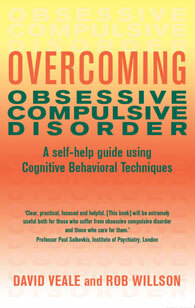 Obsessive Compulsive Disorder (OCD) is the fourth most common mental health problem. Sufferers are plagued by a recurring thought, image or urge that just won’t go away (the obsession) and are then crippled by a compulsion to try to cope with their fear. For example people may fear being contaminated and so endlessly wash their hands, or they may fear disaster will strike at home and need to check the gas is turned off a hundred times before they are able to leave the house. Cognitive Behaviour Therapy has been clinically proven to reduce the symptoms of OCD significantly for the majority of people and in this book we provide a self-help approach to overcoming the condition. This accessible guide explains how readers can reduce the distress of intrusive thoughts and images, face fears, and overcome compulsions. 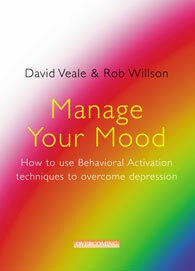 Behavioural Activation, a variation of Cognitve Behaviour Therapy is an effective approach in managing depression. It is ideally suited to self-help. By understanding and changing behaviours such as avoidance and ruminating, sufferers can gradually reinforce their positive experiences and decrease the behaviour which maintains their depression. This title includes worksheets and practical problem-solving techniques. 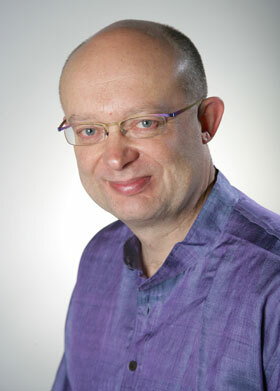 It adopts a step-by-step approach to analysing and changing behaviours. It includes an explanation of depression; case studies; and advice on diet, alcohol and drugs, St John’s Wort and medication. Many people may have a negative body self-image but, for an increasing number of people, this can turn into a more serious preoccupation. One to two per cent of the population will develop Body Dysmorphic Disorder (BDD), a condition characterised by severe preoccupation with a perceived defect in one’s appearance. 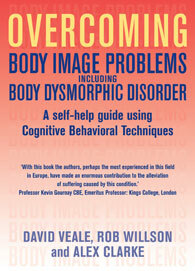 Body image problems are also linked to eating disorders and disfigurements. However, they can be successfully treated with cognitive behaviour therapy (CBT) and the book provides a step by step guide. BY DAVID VEALE AND ROB WILLSON. How can you stop worrying about your health and enjoy life? Many of us have a tendency to worry unnecessarily about our health. For some the anxiety becomes severe, and they may spend many hours checking for symptoms, seeking reassurance from others, surfing the internet for information about different diseases, or repeatedly visiting their doctor. It is distressing for them and for everyone around them. 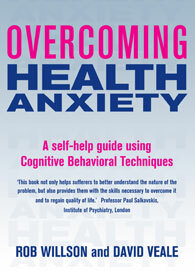 In fact, health anxiety can be successfully treated with cognitive behaviour therapy – the approach taken in this self-help guide. Using a structured, step-by-step approach we explain how the problem develops, how to recognise what feeds it and how to develop effective methods of dealing with it. Accessible and reassuring Includes questionnaires, case studies and exercises. Includes specific help for dealing with fear of death and fear of vomiting. This book is written for health professionals. Both hardback and paperback editions are available. 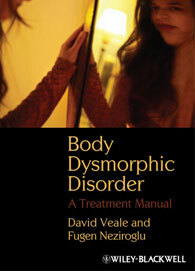 Body Dysmorphic Disorder: A Treatment Manual is the first publication to provide both an overview of the current knowledge of BDD and a treatment manual using cognitive behaviour therapy and medication. Owing to a lack of research, BDD is often misdiagnosed and treated inappropriately. Patients frequently mask their main condition and present with symptoms of depression, social phobia, or obsessive–compulsive disorder, resulting in treatment with misdirected therapies and inappropriate anti–psychotic medication.